Those heading down towards Avignon this year can take a side trip to the new visitor centre just opened by Ogier, one of Châteauneuf-du-Pape’s biggest names. 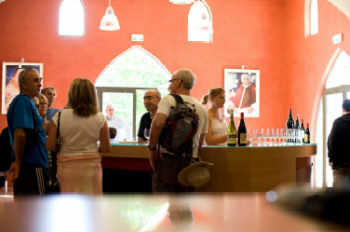 The centre is located at Ogier’s cellars and is divided into three parts to give “a comprehensive, easy-to follow guide to the region and its wines.” The Conservatoire des Terroirs de Châteauneuf-du-Pape is planted with the main grape varieties of the appellation and a guided tour of the garden explains how geology has left its mark on the terroir. Secondd is a visit to the legendary cellars that stretch for 300 metres and are unique in that humidity and temperatureis controlled naturally by artesian wells. Finally the exhibition area and tasting room, where tutored tastings are on offer. See www.ogier.fr. The Academy of Food and Wine Service has revealed that 16 of the UK’s top sommeliers have made it through to the final of the Champagne Piper-Heidsieck UK Sommelier of the Year competition. Good luck to all of them at the finals, to be held in London on 1 June 2011. They are: Wiremu Andrews, Hotel du Vin, Cheltenham; Loic Avril, The Fat Duck, Bray; Arnaud Bardary, Maze, London; Tobias Brauweiler, Ellenborough Park, Cheltenham; Remi Cousin, The Fat Duck, Bray; Sergio Dos Santos, Atlantic Hotel, Jersey; Bavand Foroughi, Claridge’s, London; Michael Jenni, L’Autre Pied, London; Johann Jousselin, The Vineyard at Stockcross, Newbury; Lukasz Kolodziejczyk, The Fat Duck, Bray; Kathrine Larsen, Le Pont de la Tour, London; Philippe Moranges, Hakkasan, London; Adam Pawlowski, Northcote, Blackburn; Mark Perlaki, Hotel du Vin, Harrogate; Stephen Raducki, Lime Wood, Lyndhurst; Clement Robert, Summer Lodge, Evershot. Addressing the 3rd World Congress on Climate Change and Wine in Marbella, Spain, former United Nations Secretary-General and Nobel Peace Prize winner, Kofi Annan, paraphrased Winston Churchill: “I could not live without Champagne; in victory I deserve it and defeat I need it,” to which he added, “I could not live without drinking wine.” The event was held 13-14 April 2011 with the participation of wine industry and research experts. Annan´s speech focused on protecting the planet where biodiversity is at risk from the effects of climate change. 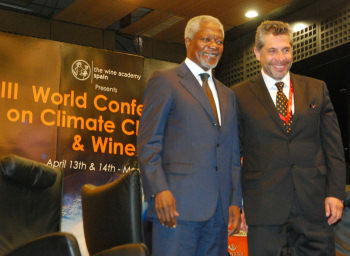 He acknowledged that wine is a culture “especially sensitive to climate change but offering a highly interesting platform to open a broader discussion.” In this he recognized that the wine sector, “is not only aware of the problem but are also concerned for the possible effects on food crops, the production, and its costs.” Photo: Kofi Annan with Pancho Campo MW of The Wine Academy of Spain. That was the rather alarmist suggestion in a press release from Dartington Crystal, who say sales of whiskey and beer glasses have rocketed, “revealing the decline of wine,” but unrelenting rise of the home bar. Dartington Crystal says it has seen sales of its spirit and beer glasses outstrip its perennial favourites, items from their Wine Master and Wine Essentials ranges. 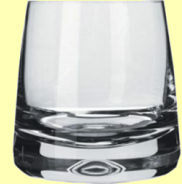 Looking at web sales between 01 November 2010 and 28 February 2011, three of the top 10 selling products were whisky glasses with the number one ‘Classic Single Whiskey Glass’ out selling the second placed product (Armchair Spirits Brandy Swirler) almost twice over. Quite how that is evidence of wine being in decline is, er…, not as clear as crystal. For the man who has everything (except a life perhaps), the English company Henry Tuke has launched what it claims is “the world’s most expensive Champagne sabre.” The sabre was launched in the gardens of Champagne house Canard-Duchêne, and the launch include founder of Henry Tuke, Tom Tuke-Hastings, “smashing the World Record,” by sabering 35 bottles in one minute (beating the existing record of 27 bottles apparently). 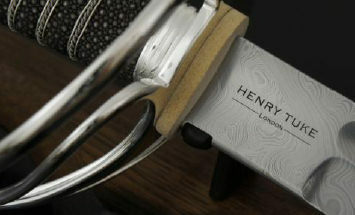 If you fancy your chances of doing 36, the sabre costs £27,000 from henrytuke.com.